SKIMS Srinagar Kashmir SKIMS Recruitment 2018: SKIMS recently published the official jobs notification for the posts Junior Medical Officer-I, Scientist-I (Statistics) jobs. SKIMS Soura Srinagar going to recruit Junior Medical Officer-I, Scientist-I (Statistics) vacancies. All the interested candidates can apply for the vacant positions in the SKIMS. The SKIMS Srinagar published vacancies for Hiring Unemployed candidates of J&K. Interested Candidates must possess at least MBBS Degree from recognized University Junior Medical Officer-I Master’s Degree in Bio-statistics/ Statistics or its Equivalent degree with 1st Div. & 2 yrs experience for Scientist -I (Statistics) from an institute recognized by the State Government to apply for the same post. 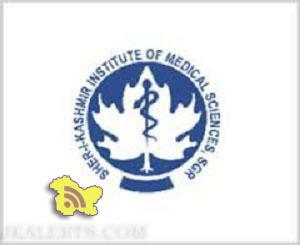 SKIMS Medical College Srinagar Kashmir Jobs Details. All the interested and Eligible candidates can apply through applications as per the attached format with the attested copies of certificates/documents shall reach the office of undersigned up to 25 August 2018. Jkalerts will provide you the complete detail about this J&K Govt job notification like Eligibility criteria, How to apply Online, Important dates, Age limit with relaxation, post by category, Selection process & official notification. So interested candidates are requested to read it carefully to apply SKIMS Soura jobs. Qualification: Master’s Degree in Bio-statistics/ Statistics or its Equivalent degree with 1st Div. & 2 yrs experience or Master’s Degree in Bio-statistics/ Statistics or its Equivalent degree with 2nd Division and PhD degree in the relevant subject from a recognized University. 1. Working knowledge of statistical packages, SPSS, SAS, STRATA etc. 2. Working knowledge of data management, data analysis using various types of data entry packages (online/offline) including computerization of proformas. Applications as per the attached format with the attested copies of certificates/documents shall reach the office of undersigned up to 25 August 2018. No application shall be entertained beyond the last date. Applications without complete documents will not be entertained. 1. The posts will be filled up purely on temporary basis. 2. The appointment can be terminated with one month notice from either side without assigning any reason. 3. Since the post is purely temporary, the candidates selected will have no claim for regular appointments under the above project or continuation of his/her services in any other project. Also the candidate cannot claim for any regular appointment at this Institute after termination of the project. 4. NO TA/DA etc. will be given to attend the Interview or joining of post and candidate should make his/her own arrangement for stay for interview and joining of post. 5. Qualification and experience should be from any Govt, recognized reputed organization. 6. Experience will be counted only after completion of minimum education qualification. 7. Mere fulfilling of essential qualification does not guarantee for the interview call and selection. Applications as per the attached format with the attested copies of certificates/documents shall reach the office of undersigned up to 25 August 2018. For SKIMS Soura jobs notifications. Free Job Alerts and Updates for both Fresher and Experienced Candidates. Keep Visiting Jkalerts.